Riceberry (Thai: ข้าวไรซ์เบอร์รี่) is a registered rice variety from Thailand, a cross-breed of Jao Hom Nin (JHN), a local non-glutinous purple rice and Khoa Dawk Mali 105 (hom mali rice). The variety was created by the Rice Science Center, Kasetsart University, Thailand after four years of research for nutritional properties, anthocyanin stability, and physical and cooking properties. The outcome is a deep purple whole grain rice with softness and a palatable aftertaste. Riceberry has been a popular brown rice due to its health promoting properties. Inducing people to consume more brown rice could help ameliorate food-related chronic diseases like diabetes, heart disease, high blood cholesterol, obesity, and cancers. Riceberry is grown primarily in north and northeastern Thailand. The wet season months of August through December are suitable for Riceberry planting. Riceberry is enriched with both water soluble—mainly anthocyanin—and lipid soluble antioxidants, such as carotenoid, gamma oryzanol, and vitamin E. The nutritional properties of Riceberry are concentrated in its bran, with only a small fraction in its endosperm. This is true of all cereals, meaning that it is best to consume whole, rather than polished, grains. The potential anti-cancer activity of compounds extracted from Riceberry bran was evaluated in human cancer cell lines (Caco-2, MCF-7, and HL-60). In clinical studies at the Faculty of Medicine at Ramathibodi Hospital, Mahidol University, Riceberry whole grain rice was determined to have a "medium" glycemic index (GI=62). Riceberry bran has the potential to improve hyperglycemia and hyperlipidemia as well as alleviate oxidative stress and inflammation. The effect of Riceberry oil supplements also affected hyperglycemia and changes in lipid profile in Streptozotocin (STZ)-induced diabetic rats fed a high fat diet. Riceberry bran oil, a nutraceutical food, may be useful as an alternative food supplement for the alleviation of hyperglycemia and dyslipidemia conditions. 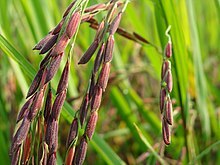 Riceberry has potential as an effective agent for neurodegeneration and memory impairment in Alzheimer's disease. The Commerce Ministry aims to increase Riceberry cultivation from 5,000 rai to 20,000 rai (3,200 hectares) by 2018 to address in the world market demand for organic brown rice. The yield from 5,000 rai amounts to only 1,500 tonnes. Demand for premium organic rice is still small, accounting for only one to two percent of total rice exports, but as Riceberry sells for two or three times the price of white rice, it has the potential to increase farming incomes. As of 2015[update] Riceberry sold in the domestic market for about 50 baht a kilogram, while the export price was 200 baht per kilogram. ^ a b "ข้าวไรซ์เบอร์รี่ Riceberry". Rice Gene Discovery & Rice Science Center (RGD&RSC). Kasetsart University. Retrieved 27 December 2017. ^ รัชนี คงคาฉุยฉายและคณะ. 2553. รายงานการวิจัย โครงการบูรณาการเทคโนโลยีชีวภาพในการสร้างพันธุ์ข้าวเพื่อเพิ่มมูลค่าและคุณค่าสูง: โครงการวิจัยย่อยที่ 4: การศึกษาคุณค่าทางโภชนาการเบื้องต้น และการประเมินความเป็นประโยชน์ของธาตุเหล็กจากข้าวในระดับเซลล์. สำนักงานคณะกรรมการวิจัยแห่งชาติ. ^ Leardkamolkarn V, Thongthep W, Suttiarporn P, Kongkachuichai R, Wongpornchai S, Vanavichit A. 2011. "Chemopreventive properties of the bran extracted from a newly-developed Thai rice: The Riceberry". Food Chemistry. 125 (3): 978-985. ^ Prangthip, P., Surasiang, R., Charoensiri, R., Leardkamolkarn, V., Komindr, S., Yamborisut, U., Vanavichit, A., Kongkachuichai, R. 2013. "Amelioration of hyperglycemia, hyperlipidemia, oxidative stress and inflammation in steptozotocin-induced diabetic rats fed a high fat diet by riceberry supplement". Journal of Functional Foods. 5 (1):195-203. ^ Kongkachuichai, R., Prangthip, P., Surasiang, R., Posuwan, J., Charoensiri, R., Kettawan, A., Vanavichit, A. 2013. 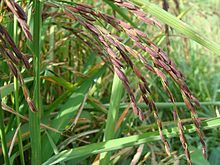 "Effect of Riceberry oil (deep purple oil; Oryza sativa Indica) supplementation on hyperglycemia and change in lipid profile in Streptozotocin (STZ)-induced diabetic rats fed a high fat diet". International Food Research Journal. 20 (2): 873-882. ^ Wassanan Pannangroung, Jintanaporn Wattanathorn, Supaporn Muchimapura, Somsak Tiamkao, Terdthai Tong-Un. 2011. "Purple Riceberry is neuroprotective and enhances cognition in a rat model of Alzheimer's disease". Medical Food 14:688-94. ^ a b Pratruangkrai, Petchanet (2015-11-06). "Riceberry plantation to expand". The Nation. Retrieved 27 December 2017. ^ Pratruangkrai, Petchanet (2014-05-12). "Farmers growing organic rice enjoy good returns and health". The Nation. Retrieved 27 December 2017. ^ Sitthitool, Ruksith (2015-11-26). "Thailand to increase organic Riceberry rice for the world market". Thai Tribune. Retrieved 27 December 2017.